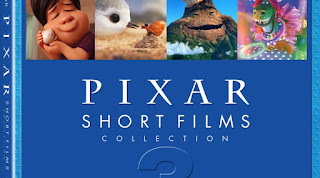 Pixar Shorts Volume 3 releases today, Nov. 13th just in time for holiday gift giving. If you're a fan of seeing these fun shorts before full length films at the theater, you'll be excited that you can now own them and watch them as much as you like! I received a copy of Pixar Short Films Collection 3 for review. This post contains affiliate links. Filmmaker Intros – Each short’s filmmaker(s) will provide an intro to their film. Disney•Pixar has the ability to make you laugh, tear up, and warm your heart in the span of just a few minutes. My girls enjoyed seeing these short films again, especially "Bao", "Party Central", and "Riley's First Date." The bonus mini-movies are also fun, and I find the bonus features telling how the filmmakers came up with their ideas really fascinating. Pixar's Short Films Collection Volume 3 makes a great stocking stuffer for the fan in your life!